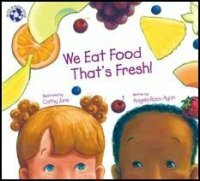 And the 2009 Moonbeam Children’s Book Award goes to….We Eat Food That’s Fresh written by Angela Russ-Ayon and illustrated by Cathy June. Congratulations ladies for serving up a delicious treat while empowering parents and children to learn more about the importance of establishing proper eating habits and having fun in the process. Join the children on an island adventure with a quirky chef who whips up their interest in trying an array of tasty new fruits and vegetables. From the garden to the kitchen, he awakens their curiosity regarding the mysterious world of flavorful and unfamiliar produce as he mixes, beats, and stirs them into delicious new combinations and recipes. Will this persuasive chef capriciously entice his visitors into trying something new? June’s scrumptious pastel illustrations are blended beautifully with Russ-Ayon’s easy rhymes and rhythmical verses. This delightful picture book comes with a CD which includes an audio book and a musical companion song that will delight children with its carefree island beat. The book’s text flows beautifully with easy rhymes and repetitive verses which will work well for individual, group, buddy, or choral reading.